Injured Dakar champion Toby Price has revealed the extent of injuries to his badly broken left leg for the first time. An x-ray Price posted on his Twitter account shows the left femur has snapped in several places. Factory Red Bull KTM ace Price faces a difficult recovery after crashing while in a position to win the fourth stage of the Dakar Rally. 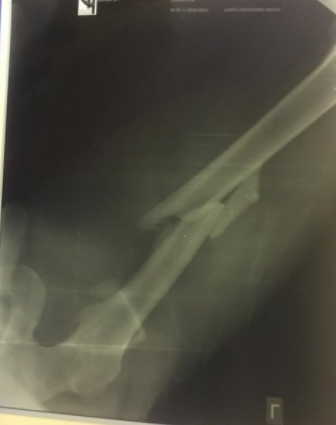 “Here is the aftermath of my crash during the @dakar, breaking my femur into 4 pieces! Long road ahead but we’ll be back,” Price Tweeted. The 2016 Dakar champion remains in a La Paz hospital in Bolivia. Former MotoGP rider Jeremy McWilliams replied to Price’s tweet, predicting he would be up and about riding in less than two months. “I had the same, first 4/5weeks not much fun but you’ll be good as new in no time. 7 weeks you’ll be riding,” McWilliams Tweeted. McWilliams was referring to a testing crash he had at Jerez when he suffered a broken femur, collarbone, ribs and lost a finger.